Sometimes offense is the best way to go. Aggressive, charming and beautiful, all at once, Mae West is an actress, a model and a comedienne well recognized in the Hollywood. An extrovert of extreme proportions, West went to on to become one of the most controversial Hollywood stars. Irrespective of her personal shortcomings, she excelled in her professional life majorly contributing towards the Hollywood. An esteemed veteran, she was named the 15th among greatest female stars of classic American cinema. She directed many plays and scripted various movies, of which a major part was adult comedies. Besides personal struggles, she often faced professional opposition in form of censorship. However, nothing could break her confidence and her moral to the slightest. 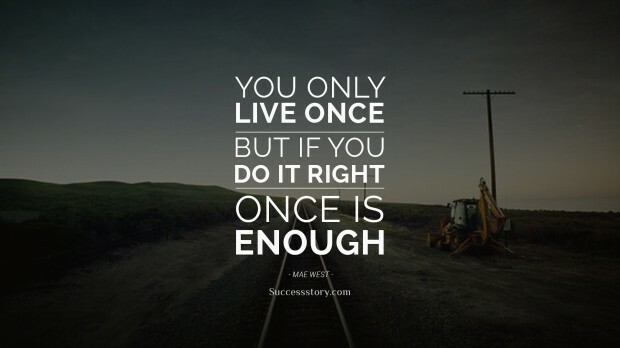 "You only live once - but if you work it right, once is enough"
Her quotes are a paradigm for modern day women. Some of her quotes are an illustration for men on how to treat their ladies. Focused around the unique abilities of every woman, she openly expresses that every lady should be bold and beautiful. Her career as a comedienne is in itself an encouragement for various ladies to achieve what they think is impossible. She was very open about her sexual desires and preferences in some of her quotes. It suggests that she was not only talented but lover herself above all. Her quotes therefore, are said to revolve around an individual and how one should love oneself the most. These quotes encourage women to be bold and confident. They are an inspiration for a woman to be treated like a princess.